Since the inception of the English football league competition, the Premier League, in 1992, more than 100 players have scored three goals (a hat-trick) or more in a single match. 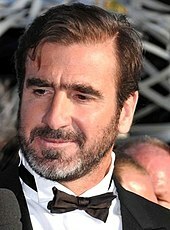 The first player to achieve the feat was Frenchman Eric Cantona, who scored three times for Leeds United in a 5–0 victory over Tottenham Hotspur. Twenty players have scored more than three goals in a match; of these, five players, Andy Cole, Alan Shearer, Jermain Defoe, Dimitar Berbatov and Sergio Agüero have scored five. Sadio Mané holds the record for the quickest Premier League hat-trick, netting three times for Southampton against Aston Villa in 2 minutes 56 seconds, breaking Robbie Fowler's record, while in 1999, Manchester United player Ole Gunnar Solskjær scored four goals in twelve minutes as a substitute against Nottingham Forest, "the fastest scorer of a four-goal haul on record in England". 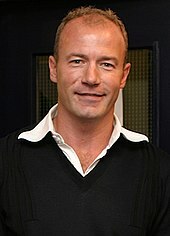 Alan Shearer is the first player to score a joint-record 11 Premier League hat-tricks, for Blackburn Rovers and Newcastle United. Sergio Agüero scored the most hat-tricks for a single club, netting 11 hat-tricks for Manchester City. Since the inception of the English football league competition, the Premier League,[a] in 1992, more than 100 players have scored three goals (a hat-trick) or more in a single match. The first player to achieve the feat was Frenchman Eric Cantona, who scored three times for Leeds United in a 5–0 victory over Tottenham Hotspur. Twenty players have scored more than three goals in a match; of these, five players, Andy Cole, Alan Shearer, Jermain Defoe, Dimitar Berbatov and Sergio Agüero have scored five. Sadio Mané holds the record for the quickest Premier League hat-trick, netting three times for Southampton against Aston Villa in 2 minutes 56 seconds, breaking Robbie Fowler's record, while in 1999, Manchester United player Ole Gunnar Solskjær scored four goals in twelve minutes as a substitute against Nottingham Forest, "the fastest scorer of a four-goal haul on record in England". The fixture between Arsenal and Southampton at Highbury in 2003 saw both Jermaine Pennant and Robert Pires score a hat-trick for the home team. In 2007, Blackburn's Roque Santa Cruz and Wigan's Marcus Bent both scored hat-tricks in a match that Wigan won 5–3. Only five players – Les Ferdinand, Ian Wright, Didier Drogba, Wayne Rooney and Harry Kane – have scored hat-tricks in two consecutive league games. Rooney's hat-trick on 10 September 2011 and Matt Le Tissier's hat-trick on 19 August 1995 were scored through set pieces, which consists of penalty kicks and direct free kicks. Everton's Duncan Ferguson and Salomón Rondón of West Bromwich Albion are the only Premier League players to have scored a hat-trick of headers. Shearer and Sergio Agüero have scored three or more goals eleven times in the Premier League, more than any other player. Robbie Fowler has scored nine; Thierry Henry and Michael Owen have scored eight hat-tricks each. Five players have each scored hat-tricks for three different clubs: Yakubu (Blackburn Rovers, Everton and Portsmouth); Nicolas Anelka (Arsenal, Chelsea and Manchester City); Kevin Campbell (Arsenal, Everton and Nottingham Forest); Les Ferdinand (Newcastle United, Queens Park Rangers and Tottenham Hotspur) and Teddy Sheringham (Manchester United, Portsmouth and Tottenham Hotspur). Four players have scored hat-tricks and still ended up on the losing side: Matt Le Tissier (twice), Dion Dublin, Roque Santa Cruz and Dwight Yorke. The Dubious Goals Committee has sometimes decided after a match that players have not scored hat-tricks because one of the goals was incorrectly credited to them. Southampton player Egil Østenstad was thought to have scored a hat-trick against Manchester United in 1996, but the committee ruled that one of the goals be credited as an own goal to United's Phil Neville. Anelka's first goal for Manchester City in September 2002 was later credited as an own goal to Everton's Tomasz Radzinski. Javier Hernández was denied a hat-trick against Aston Villa in November 2011 after the committee ruled his second goal was actually an own goal by Ron Vlaar. Eric Cantona scored the first hat-trick of the Premier League. 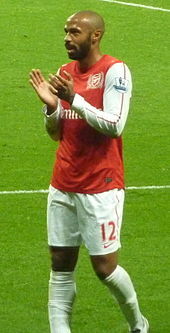 Thierry Henry scored eight hat-tricks for Arsenal between 2000 and 2007. Frank Lampard scored three Premier League hat-tricks in 17 years. 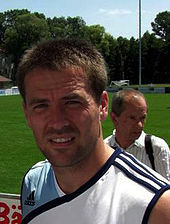 Michael Owen scored eight hat-tricks. 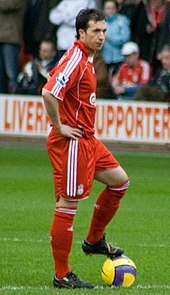 Robbie Fowler scored three or more goals on nine occasions. Ole Gunnar Solskjær scored four goals in twelve minutes against Nottingham Forest after coming on as a second-half substitute. 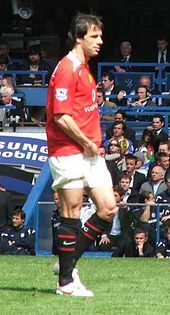 Ruud van Nistelrooy scored five hat-tricks for Manchester United. Emmanuel Adebayor scored a hat-trick for Arsenal in both games against Derby County in 2007–08, the first time a player scored three goals in both fixtures against the same team in a season. Roque Santa Cruz scored a hat-trick for Blackburn Rovers in a 5–3 defeat against Wigan Athletic. Despite scoring 84 league goals for Manchester United, Cristiano Ronaldo only scored one hat-trick, in a 6–0 victory against Newcastle United in January 2008. Jermain Defoe scored five goals against Wigan Athletic in Tottenham Hotspur's 9–1 victory in November 2009. 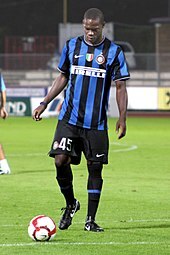 Mario Balotelli scored a hat-trick, including two penalties, in Manchester City's 4–0 victory over Aston Villa in December 2010. Cameroon player Somen Tchoyi scored a hat-trick for West Bromwich Albion in May 2011. 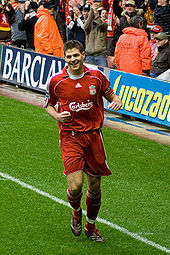 England player Steven Gerrard became the first player in Premier League history to score a hat-trick in the Merseyside derby in March 2012. Japanese player Shinji Kagawa became the first Asian player in Premier League to score a hat-trick in March 2013. Uruguayan international Luis Suárez scored three hat-tricks for Liverpool within a calendar year from April 2012. In December 2013, he became the first player in the Premier League to score three hat-tricks against the same team (Norwich City). Sadio Mané's hat-trick in 2 minutes 56 seconds against Aston Villa in May 2015 is the fastest in Premier League history. Algerian player Riyad Mahrez became the first Arabian player in Premier League to score a hat-trick in December 2015. The following table lists the minimum number of hat-tricks scored by players who have scored two or more hat-tricks. Players in bold are still active in the Premier League. The following table lists the number of hat-tricks scored by players from a single nation. a The Premier League, created in 1992, is the top tier of English league football. 1 2 3 McNulty, Phil (25 February 2004). "The hat-trick Hall of Fame". BBC Sport. Retrieved 13 July 2009. ↑ Harris, Nick (29 August 2007). "Unassuming supersub who merits a place among the Old Trafford greats". The Independent. London. Retrieved 21 July 2009. ↑ Hubbard, Norman (27 September 2011). "Fastest UCL goals, little and large". ESPN Soccernet. Retrieved 28 September 2011. ↑ Hubbard, Norman (13 September 2011). "Four-goal salvos, hat-trick heroes". ESPN Soccernet. Retrieved 28 September 2011. 1 2 "West Bromwich Albion 3–1 Swansea City". BBC Sport. 14 December 2016. Retrieved 29 May 2017. ↑ "These are the five occasions a player has scored a hat-trick for the losing side in the Premier League". 1 November 2015. ↑ Bevan, Chris (3 February 2006). "Hat-trick hero still going strong". BBC Sport. Retrieved 18 July 2009. ↑ "On this day in 1996: Man Utd hit for six at Southampton". Premier League. 26 October 2014. Archived from the original on 30 March 2016. Retrieved 26 January 2016. ↑ Kay, Oliver (10 September 2002). "No regrets for Anelka on return to Arsenal". The Times. London. Retrieved 18 July 2009. ↑ Tuck, James (20 November 2011). "Chicha denied treble". Manchester United F.C. Official Website. Retrieved 14 September 2014. ↑ "Cristiano Ronaldo". Soccerbase. Archived from the original on 20 March 2009. Retrieved 26 July 2009. ↑ Andrews, Phil (26 August 1992). "Football: Cantona hits hat-trick to crush Spurs". The Independent. London. Retrieved 11 October 2009. ↑ "Robins calls it a day". BBC Sport. 25 May 2004. Retrieved 11 July 2009. ↑ Dobson, Frank (6 December 1992). "Football: Rovers rocked by Hendrie hat-trick". The Independent. London. Retrieved 11 July 2009. ↑ Fox, Norman (29 December 1992). "Football: Everton's day of dismissals". The Independent. London. Retrieved 11 July 2009. ↑ Andrews, Phil (17 January 1993). "Football: Deane gets about Town". The Independent. London. Retrieved 11 July 2009. ↑ Haylett, Trevor (22 February 1993). "Football: Barmby poses a national problem". The Independent. London. Retrieved 11 July 2009. ↑ Edworthy, Niall (11 April 1993). "Football: Strachan inspires". The Independent. London. Retrieved 11 July 2009. ↑ Elliot, Sam (11 April 1993). "Football: Forest full of goals and holes". The Independent. London. Retrieved 11 July 2009. ↑ Andrews, Phil (13 April 1993). "Football: Wednesday's strength in depth". The Independent. London. Retrieved 11 July 2009. ↑ "Everton 3–5 QPR". Soccerbase. 12 April 1993. Archived from the original on 8 July 2009. Retrieved 13 January 2009. ↑ Haylett, Trevor (15 April 1993). "Football: Sutton does the trick to inspire Norwich: Champions still without an away win as Canaries rediscover their scoring touch". The Independent. London. Retrieved 11 July 2009. ↑ "Liverpool 4–0 Coventry". Soccerbase. 17 April 1993. Archived from the original on 8 July 2009. Retrieved 13 January 2009. ↑ "Coventry 3–3 Leeds". Soccerbase. 8 May 1993. Archived from the original on 8 July 2009. Retrieved 13 January 2009. ↑ Smith, Rob (2 May 2008). "The Joy of Six: great escapes". The Guardian. London. Retrieved 11 July 2009. ↑ "On this week..." Coventry City F.C. 17 August 2007. Archived from the original on 8 December 2008. Retrieved 11 July 2009. ↑ Dobson, Frank (22 August 1993). "Football: Cottee hits heights". The Independent. London. Retrieved 13 July 2009. ↑ "Arsenal 4–0 Ipswich". Soccerbase. Archived from the original on 17 May 2005. Retrieved 13 July 2009. ↑ "Everton 1–5 Norwich". Soccerbase. Archived from the original on 8 July 2009. Retrieved 13 January 2009.